Comments: Celtic and vocals keep this CD afloat. I'm in the unusual position of not being crazy about the .hack//SIGN anime, but adoring the music for the series, especially the vocal songs. So, while I'm not a huge fan of the series, the OST is one of my favorite anime releases in a while. The excellent .hack//SIGN score was composed by Yuki Kajiura (who also did the scoring for Noir) and one familiar with both series will immediately see the similarities between the two. One can basically divide up the songs on this CD into two categories, the vocal songs and the BGM. I much prefer the vocal music to Kajiura's BGM as the latter sounds much too video-game like for an anime (even one about a fictional MMORPG). 01 Yasashii Yoake (TV Size) [1:33] - The OST CD, the first of two major releases for .hack//SIGN begins with "Yasahii Yoake," an unusual choice to start off with, since this is the television series' ending theme. As the title suggests, it is the shorter version of the song used in the television series (the full theme is on the .hack//SIGN OP/end single). It's a somewhat sad song, featuring vocals by See-Saw (who feature prominently on the .hack//SIGN OST and also did the ending theme for Gundam SEED. It sounds a bit Celtic, as do many songs on the soundtrack. 02 The World [5:03] - "The World," follows the Celtic theme by using otherworldly vocals and a quick violin (I almost want to call it a violin jig) for the first minute or so of the song. After this, the song's English vocals start. For anyone who has seen the anime, the song will immediately be familiar, because it is played often during the show's action scenes and serves as a theme for the game's world, "The World." 03 Kiss [1:48] - "Kiss" is a simple violin and piano song, used to set mood in the anime. Except for some interesting string composition towards the 50-second mark, it's not very remarkable and indeed, wouldn't be very noticeable within the anime itself. 04 Key of Twilight [3:45] - Though I like all the vocal songs on this CD, my favorite is definitely "Key of Twilight." The song features very light bass, some very interesting guitar work, and beautiful vocals and lyrics. Indeed, the lyrics for "Key of Twilight" are very poetic. While the vocals and instruments are very "soft," the beat and pacing are very upbeat. 05 Valley of Mist [3:34] - "Valley of Mist" starts of quietly, like a simple video game BGM, but grows into a foreboding electronic theme, very characteristic of Kajiura. 06 Where the Sky is High [2:46] - Similar to "Valley of Mist," "Where the Sky is High" is another electronic theme, but is more upbeat than track five. Track six, indeed, sounds more "soaring." They both sound very video game-ish: where "Valley of Mist" might be more like a dark dungeon, "Where the Sky is High" would be a green plain or even a victory theme. 07 Fake Wings [2:35] - Another very familiar theme, "Fake Wings" serves as Subaru's theme in .hack//SIGN (and is well titled, since she too has fake wings). The first minute of the song is simple the guitar portion of the song. At about 1:45, the vocals, second guitar, and simple bass come in. Like most of the vocals on the .hack//SIGN OST, here they are female and very otherworldly. 08 Interlude [2:04] - While sleigh bells have been used on many tracks on is soundtrack, "Interlude" uses them most prominently. Track eight also mimics the melody of Yasashii Yoake - this version is used more in the anime when Yasashii Yoake would make sense, but there is important character dialogue. 09 Fear [2:40] - "Fear" begins with a childlike electronic melody on top of foreboding instrumentals and from there moves into a digital beat. The song combines the childlike humanity into a frightening digital reality. At the one-minute mark the digital instruments take over; it's an obvious analogy to the series' plot. 10 Aura [3:04] - "Aura" comes in a close second (if that) as my favorite song on this CD. It is not as widely used as "Key of Twilight" or "The World", but it is another mood-setting vocal song, featuring haunting vocals and great lyrics. It is much darker than "Key of Twilight," both in lyrics and the way the vocals harmonize. 11 Before Dawn [1:56] - More BGM. This is a simple, short song featuring just a piano theme. Not extremely noteworthy. 12 Foreigners [2:07] - "Foreigners" is one of the most Celtic themes on the entire CD, featuring what sounds like native drums, a lute-like instrument, and sleigh bells. It's another BGM track, but it is one of the most Celtic in composition and instruments. 13 BT [2:36] - BT's theme is a sad, slow track, featuring piano melodies and violins. However, unlike "Before Dawn" it is a much more important piece in the anime and is much better listen than that previous track. 14 A Stray Child [2:47] - Another vocal track, "A Stray Child," has the most haunting vocals on the CD (other than "Silent Life"). At times they sound (lyrics, not withstanding) like a nursery rhyme. The track is somewhat reminiscent of some of the work of Akino Arai (who did the openings for Record of Lodoss War and Outlaw Star). The track starts off simply with the vocals and triangle, but progresses into digital beats. 15 Sit Beside Me [3:20] - More videogame style BGM. It actually sounds like a "throwaway" track from the Playstation game Chrono Cross. The piano handles the melody while digital instruments round out the sound. 16 Magic and Sword [2:19] - "Magic and Sword" is very Celtic and fast paced, in keeping with the swords and sorcery theme of the show's game, "The World." It's more BGM, but more interesting than the non Celtic BGM tracks. 17 A Bit of Happiness [2:29] - Another slow heavy piano theme (luckily, what sounds like an accordion picks up the melody early on). A sleepy, introverted track. 18 Silent Life [4:07] - I hesitate to call "Silent Life" a vocal track, because it does feature vocals, but they are there more for sound than for lyrics. It's hard to pick out any individual words in the opening of this track, but after the vocal intro, it progresses into a more standard BGM with a piano melody. 19 Obsession (TV Mix) [1:37] - A wake-up call after several quieter tracks, "Obsession" is the fast paced opening theme song for .hack//SIGN. It is apparent why this track didn't open the CD; for the most part it doesn't fit in with the other tracks. Like Yasahii Yoake the version on this CD is the shorter TV sized theme. Overall, the CD is a mixed bag. The vocal themes are great and, frankly, I'd rather have a CD of all the series' vocals, as opposed to an OST. The BGM on the other hand, except for the couple of Celtic style tunes, sounds like stuff rejected from a console RPG. 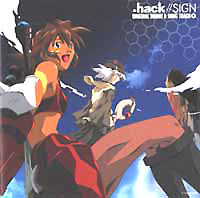 .hack//SIGN OST1 is a definite try before you buy CD. If you watch the anime and fall in love with the songs, then it ought to be at the top of your to-buy list...then again you could always pick it up with the .hack//SIGN Vol.1 Limited Edition box set.